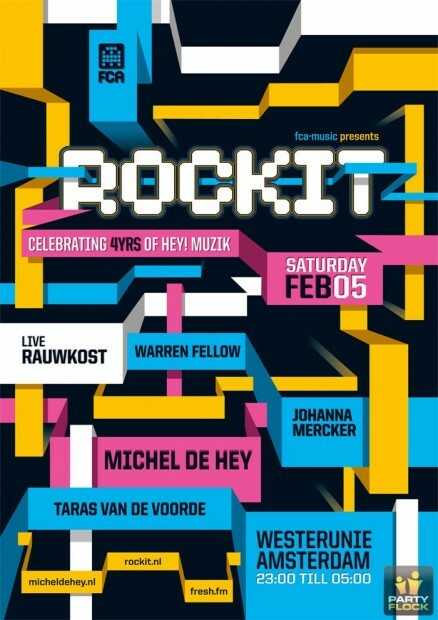 Next Monday’s Hangover: Electric Deluxe, Dekmantel, We are E, Rockit & O.N.K.E.L. 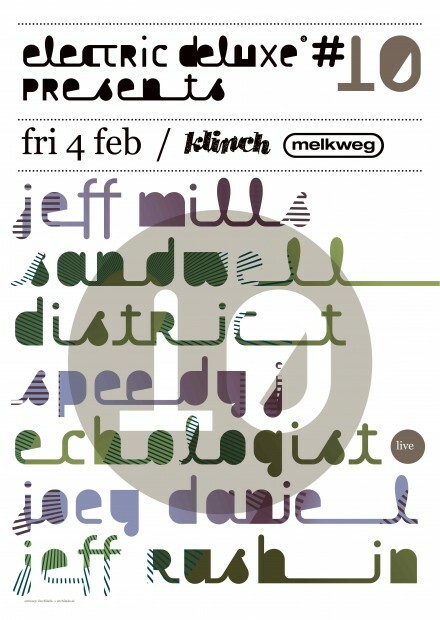 Jeff Mills, Sandwell District and Speedy J on the tables, not the least of names! But hear me out, on the controllers and live set-ups: Echologist, Joey Daniel and Jeff Rushin. Jeff Mills started off performing DJ tricks like beat juggling and scratching during his sets. Mills, Robert Hood and former Parliament bass player ‘Mad’ Mike Banks were founding members of Detroit techno collective Underground Resistance (UR), which embraced revolutionary rhetoric and only appeared in public dressed in ski masks and black combat suits. Nowadays, he is often referred to as the most successful techno representative from Detroit. Don’t get me started on the other guys. Less talk, more action! Also on this Friday, Larry Heard, aka Mr Fingers or the godfather of deep house, is making an appearance at our pop temple Paradiso. He was the leader of the influential group ‘Fingers Inc.’ and has recorded solo under various names, most notably Mr. Fingers. Not ringin’ any bells yet? Just listen to this classic. Supporting the guy: Metro Area, Lone, Hunee, Casper Tielrooij, Tom Trago and Thomas Martojo. I cannot tell you which line-up is the better one at Leidseplein, you tell me! Can’t choose between the two above? Not so into (deep) house? Feel more at home at Rembrandtplein and is (minimal) techno from Amsterdam more your thing? Then Studio 80 is the place to go fist pumping this Friday. 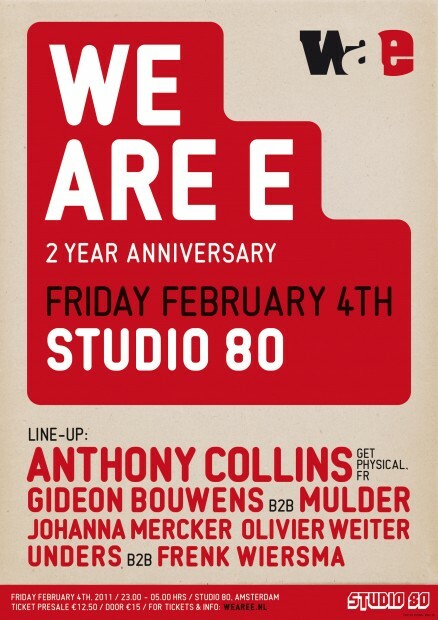 I’ve been a fan of the ‘We Are E‘ label for a while, as a platform for local up and coming electronic producers and as a party host, so I can seriously recommend you their 2 year anniversary party. For the occasion Anthony Collins will be flying over to headline, supported by back to back performances by Gideon Bouwens + Mulder, Unders + Frenk Wiersma and Johanna Mercker + Olivier Weiter. Support your local hustlers! Our second anniversary this weekend is taking place at Amsterdam’s west side club Westerunie. Michel de Hey has been hosting his radio show Hey! Muzik on Fresh FM for 4 years now, so a good reason to throw a party. For the occasion Michel invited some friends like Warren Fellow, Johanna Mercker, Rauwkost and Taras. Boom! Ahhh, I haven’t heard of a good party at the infamous bunker at the NDSM docks for a while. Yes, yes, it’s time to get your energizers together and bounce along to the BPMs of WOELIE ’till the early hours of Sunday morning. And by that I mean 10am (!!). If you’re afraid of being left out in northern docks of Amsterdam, get your tickets at RUSHHOUR (Spuistraat 98) early. I hear this one’s in-crowd.